The Christmas Island flying-fox (CIFF) is the last remaining native mammal on Christmas Island, a remote, beautiful, and ecologically unique part of Australia. However, Christmas Island’s biodiversity is under threat from anthropogenic change. This is evidenced by the extinction of two native rat species, and the only two mammal extinctions in Australia in the last 50 years: the Christmas Island shrew (Crocidura trichura), and the Christmas Island pipistrelle bat (Pipistrellus murrayi). In addition, there have been significant population declines in most endemic birds, and all but one endemic reptile have been lost from the wild. ​The CIFF was listed in January 2014 as Critically Endangered under the Commonwealth Environment Protection and Biodiversity Conservation (EPBC) Act 1999. The latest population estimates suggest there are no more than 900 individuals, and population trends show that if the causes of decline are not identified and remedied, it too will become extinct. The precipitous decline of the CIFF has serious implications for Christmas Island’s endemic flora and fauna, as its role in seed dispersal and pollination is critical for maintaining the health of the island’s unique ecosystems. The CIFF’s decline is paralleled by that of other fauna on the island, pointing to an unidentified but widespread malaise within Christmas Island’s ecosystems. Given the speed of CIFF decline, and the broad range of hypothesised drivers, recovery will only be achieved through an integrated and holistic approach where lines of investigation are managed in parallel by a unified team. 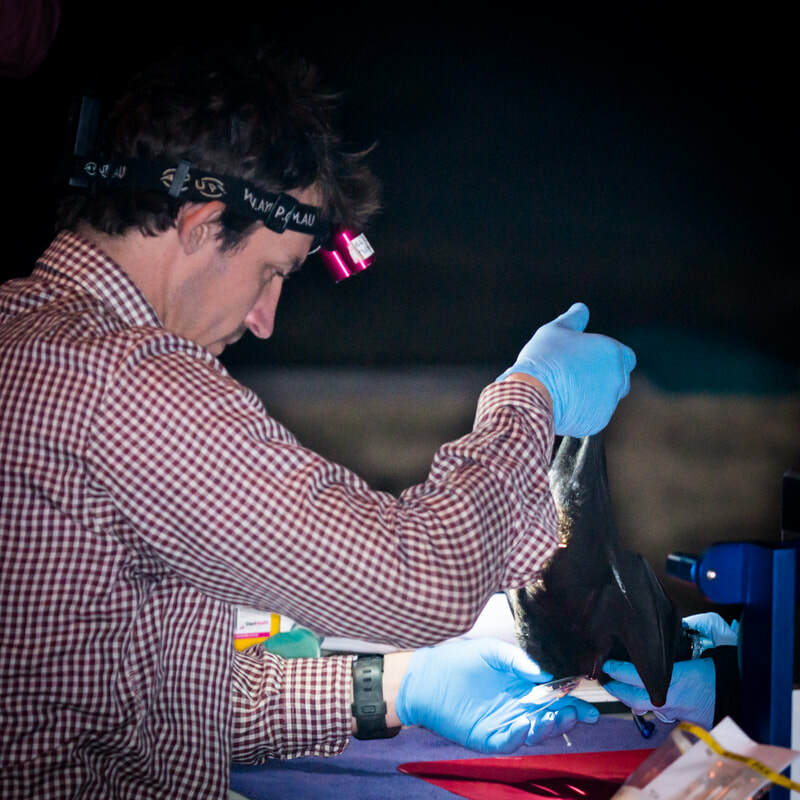 Failure to act quickly on evidence of rapid population decline led to the preventable extinction of the Christmas Island pipistrelle. It is paramount that we act now to prevent the CIFF from sharing the pipistrelle’s lamentable fate. ​To asses and combat the species' decline, a comprehensive research program has been developed under the auspices of the Hawkesbury Institute for the Environment (Western Sydney University) in collaboration with Taronga Conservation Society Australia, The University of Sydney, CSIRO, The Royal Botanic Gardens and Domain Trust, and Christmas Island National Park. 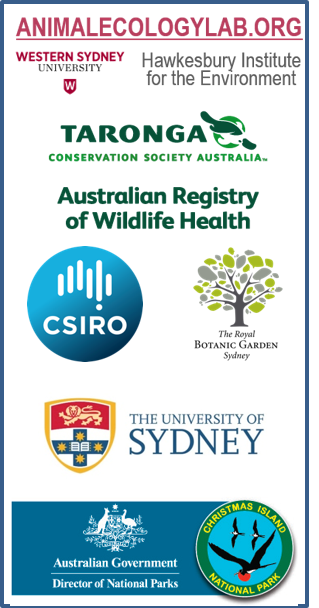 The work is funded by substantial cash inputs from the Hawkesbury Institute for the Environment, the Taronga Conservation Society Australia, and the University of Sydney, and various student grants (below); as well as important in-kind contributions from all project partners. 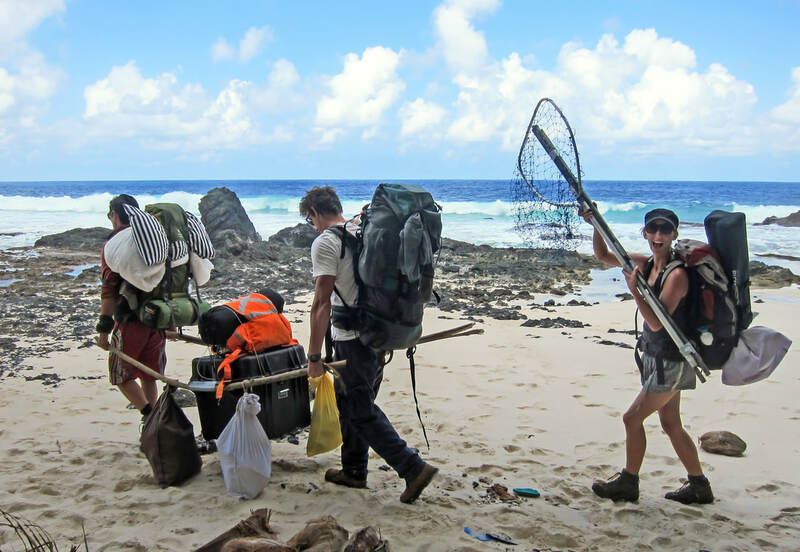 These students have received ​generous support from the F.G. Swain Award (Chris Todd), The Holsworth Wildlife Research Endowment (Annabel Dorrestein), and The Kate Barlow Award & The Paddy Pallin Foundation-sponsored ABS grant (Laura Pulscher). Annabel Dorrestein - MSc Student; (University of Utrecht): Supervisors: Dr Justin Welbergen, Christopher Todd. Topic: Impacts of yellow crazy ants on Christmas Island flying foxes. TODD, C. M., WESTCOTT, D. A., ROSE, K., MARTIN, J. M., WELBERGEN, J. A. 2018. Slow growth and delayed maturation in a Critically Endangered insular flying fox (Pteropus natalis). Journal of Mammalogy. PHALEN, D. N., HALL, J., GANESH, G. HARTIGAN, A., SMITH, G., DE JONG, C., FIELD, H., ROSE, K. 2017. Genetic diversity and phylogeny of the Christmas Island flying fox (Pteropus melanotus natalis). Journal of Mammalogy 98:428-437. HALL J., ROSE K., SMITH C., DE JONG C., PHALEN D., AUSTEN J., FIELD H. 2014. Health assessment of the Christmas Island flying fox (Pteropus melanotus natalis). Journal of Wildlife Diseases 50:447-458.